The BC-U2 battery charger simultaneously charges two compact BP-U90U60/U30 Lithium-ion batteries at high speed, providing power for XDCAM camcorders for up to six hours. * * BC-U2 can charge two BP-U90 batteries in 190 minutes, each providing 85 Wh energy to power the PMW-200 or PMW-EX1R camcorder for up to 360 minutes. For full range of capacities and camcorder running times, see features. 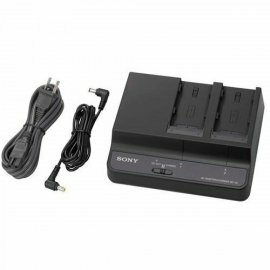 Built-in AC adaptor provides 12 V DC power output while charging one battery The BC-U2 also has 12 V DC power output cable to power a camcorder directly, while charging one battery simultaneously. The BC-U2 battery charger simultaneously charges two compact BP-U90U60/U30 Lithium-ion batteries at high speed, providing power for XDCAM camcorders for up to six hours. The BC-U2 has 12 V DC power output cable to power a camcorder directly, while charging one battery simultaneously. The BC-U2 has a mass of 650 g (1 lb 7oz) and dimensions (W x H x D) of 177 x 53.2 x 137 mm (7 x 8 1/8 x 5 1/2 inches).